Hey hey!! I just wanted to make sure everyone got the word - I posted on Facebook, but apparently forgot to actually put it in my BLOG, that I am trying to reach 100 followers, and if I get to that number, I am going to host a little NEDbeads giveaway: The random winner will be able to choose their own width and color and I will make that winner a cuff!!! (Retail $250-$400.) Like this, or completely different, up to the winner!!! There is another giveaway going on at Plumrose Lane, Sharon Henry's site. Oooo - you really want to get in on this one, I promise!! Several prizes, not just one, AND she is having a Going Out of Business sale at her shop, as well, with incredibly reduced prices on her gorgeous pieces!!! What has it done for YOU?? I should be beading. Yup. But I have been feeling terribly contemplative as of late, and thought I would share some of my pondering. In fact, I feel like I HAVE to share some of it! So, what have I been thinking about? Beads, of course. But also a lot of self analytics, apparently - although I had no idea I was doing that. I learned some stuff. It's kind of cool stuff. Wanna know? Beads have made it possible for me to be more outgoing! 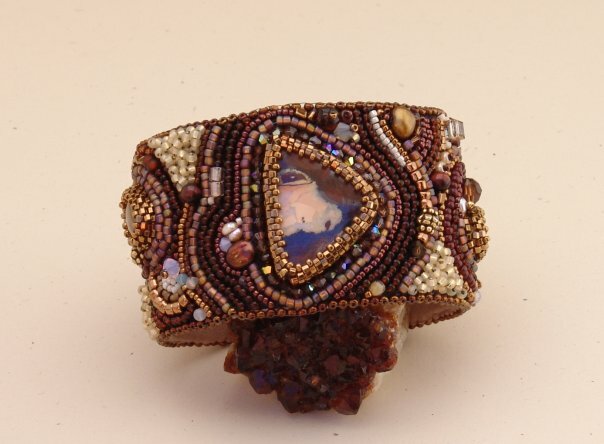 I feel like I can share my feelings and even some of my thoughts through my beadwork. I have found out that I work with fairly specific color combinations depending on my mood. I have always hidden anything emotional (unless it's good) from habit - but I have been sharing through my pieces for years things that I haven't been able to vocalize. Beads have let me break out of my hermitage, even if it is mostly vicarious. I can't make friends IRL - it's amazing if I am able to smile and grunt monosyllables if I actually meet someone face to face. But through beading and the internet I have made friends with people from ALL OVER!!! And I can talk (type), and mostly don't grunt. All good! I have even been able to relate to someone closer than that - I can talk on the PHONE with some of my new friends!! To me, this is a huge step, and has taken place gradually over the last two or three years. And beading did that for me!!!! I have met the most amazing, talented, gifted, smart, funny and fabulous people through it. I have even been able to take part in a group setting for the first time since 9th grade, something I could NOT have done three or four years ago. I would have had to leave the room - usually in tears. I actually sat down and beaded as part of a group - with other bearers - for two whole hours (Twice!!!!!!) and only needed two breaks. 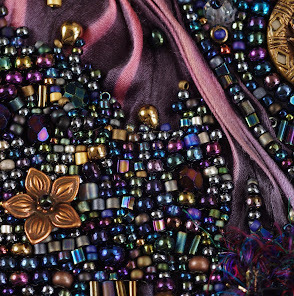 Beads have shown me that a lot of my limitations were set by myself FOR myself. I can commit to something and follow through! (I have such commitment issues you wouldn't believe it; I have trouble even committing to a dr.'s appointment, don't even ask me about relationships, I am floored that I have been able to commit to my husband.) I can stretch out creatively. I can make decisions. I can even find my own style and voice - something I could never never do with my creative writing (short stories and even one novel length piece). I have a voice?? Honest? ?This amazes me. This is so new to me. I think I am starting to figure out who "Nancy" is. Because of beads!!!! I made my first successful attempt at freeform bead weaving (have I mentioned that about a billion times in different arenas? oh well!) and found out that I have to have borders still - I can't make something without some kind of surround. Which is also very true of me, personally. I have been struggling and struggling with all sorts of things, religion, weight, perspectives, etc etc - and I am trying VERY hard to break free of limitations and restrictions that I have put on myself, or feel that society has put on me*. (*Which feels a little like a cop out...) However, I found that I was comfortable with small breaks in the surround on the bracelet...so there's hope for the rest of it, right?! Right!! Hope makes me smile. Beads have saved my sanity and helped me overcome some of my anxiety and a LOT of my depression. The lovely rhythm of weaving or embroidering soothes my soul. They allowed me to have a (small) bit of ego. I have become comfortable (in the last six months) with calling myself an artist. They have allowed me to be lots of things I like; curious ("how did you do that? How do you stitch that together? "), generous (I give away beads sometimes and have given beadwork gifts a LOT), sharing ("I did it by doing this. "), even (my God) mentoring someone else, knowledgeable ("HOW many books have you read??? No! "), focused (I can sit at the bead table for hours and hours - with breaks, of course, to stretch), and (see above) enlightened. I can't remember what I did before beading. Whatever it was, it wasn't enough. I think that a lot of what I am talking about applies to any artisan in any fine craft. Beading, leather working, metal working, lamp working, crocheting and knitting, sculpting - you name it. I would LOVE to hear about how others have been enlightened or changed by their craft. There are two beady ladies in particular that I am asking to respond to this - either on here, on Facebook, or in their own blogs - Linda Jones (yes, THAT Linda Jones, the incredibly artistic creative fabulous gorgeous woman!) and Julie Harper - who creates so MANY amazing and awe-inspiring pieces in so MANY media!!! Ladies, I would dearly love to hear about your experiences. In fact, I would love to hear from everyone!! If you have a blog, and you decide to blog about this, let me know!! I will be there in a flash! I will post your blog address! I will kiss your feet! Well, no, probably not. But I will have a great big toothy grin. PS - the photo at the top is called Woodland Floor, and is a piece of freeform right angle weave, covering a humble rock from a nearby stream. I was fortunate enough to be invited to a new (for me) Etsy team this last month!! I am very excited to announce that I am now a member of the Handmade Division Team, and let me tell YOU, this is one hugely talented team of artists. One of the cooler things that I really like about my team so far is that they give you a topic to blog about once a month, which is fantastic, as sometimes I just can't think of anything to write about. This month, the topic was irresistible for me: Something I would like to create that I don't currently have the skills to do. How do I pick just one?! Ha! Well, my first priority, I think, would be working with wire. 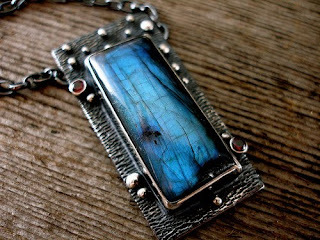 How I would love to be able to include wire wrapped bezels, little curly cues and so on into my work!!! I already add chain here and there to my beadwork, but wire would open up sooooo many possibilities. At the moment, I can't even properly construct a wrapped head pin for an earring! Honest. I can make a loop. Period. And I love trees and leaves and vines in my jewelry, so how cool would it be to be able to use seed beads on some wire to make little tendrils? Or wire leaves with little dew drop briolettes in there?? Making your own clasps and headpins? 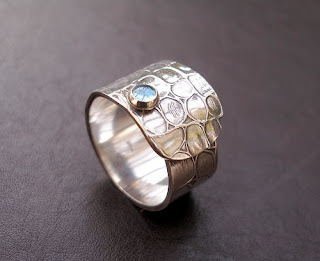 Learning that lovely 'herringbone' wrap that I have seen in some gorgeous jewelry on Etsy?? Oh, YES, I would loooooooovvvvvveeee to learn wire work. But, finding the money for the tools and wire in order to practice and perfect?? It may have to wait a little bit....and then I have to find someone patient enough to guide my fumbling hands around the tools and wire for a bit... But at some point, I WILL get there!!! Since joining the Handmade Division Team, I also met a wonderful lady named Delias Thompson, who makes astoundingly beautiful sterling jewelry that I have a horrible horrible time resisting - in fact, I immediately asked her if she would trade with me so I could get my greedy little hands on one of her necklaces and a ring to go with it... and she liked one of my cuffs. So guess who now has a stunning necklace and a ring to drool over??!!! ME!!!!! I still feel that I got the best half of this trade, for sure! Please come and see more of her work at her shop !